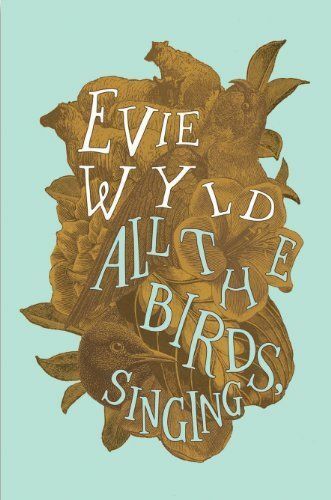 I read Evie Wyld’s first novel, After the Fire, A Still Small Voice which I loved (and was the first book I reviewed on this blog! ), so I had high hopes for her next novel All the Birds, Singing. Wyld’s second novel follows Jake Whyte as she lives alone on a British island looking after sheep. The novel opens when she finds yet another of them dead and mangled, but she doesn’t know who, or what, keeps picking them off one by one. It could be the foxes she sees in the woods, the local kids, a strange man, or a rumoured beast she thinks she glimpses on the island. But this novel isn’t a whodunit or mystery story. Instead, Wyld paints a compelling picture of a woman with a dark past who is determined to escape the world and what she is running from. Much like After the Fire, A Still Small Voice, the chapters alternate between past and present throughout. Yet, it does more than that: the chapters set in the past move backwards in time, while the ones set in the present move forward lineally. As the chapters progress and alternate, you start to gradually piece together the jigsaw of Jake’s life, one piece at a time. Jake is such a private person and she’s so fearful of people finding her or knowing her past, that the reader finding out her past through the chapters like this doesn’t feel like she is divulging the details of her past to us, but rather we are going behind her back to find out. The chapters set in the past are written in the present tense and the present ones in the past which seems confusing at first, but once I got used to this narrative style it worked incredibly well. As the chapters set in Jake’s child-and young-adulthood’s Australia move backwards in time, we get to see how Jake has changed throughout her life. We also see how expertly Wyld has characterised Jake and how her experiences have changed her, bringing us to the novel’s poignant ending. Wyld’s novel is full of vivid and original descriptions which work to create an atmospheric novel that is full of tension. It’s a sensory novel too, full of smells and sensations. When reading, I felt the oppressive heat of Australia; I felt the bitter cold of the British island Jake inhabits. The writing is beautiful throughout and Wyld has complete control over her prose and the readers’ emotions. This control over her prose and story means that Wyld masterfully feeds us information and divulges secrets at exactly the right moments – the alternating chapters work well with this – drawing us into this atmospheric story that I was disappointed to finish. On paper Jake doesn’t sound like a character we should be interested in (many of the characters in the novel don’t seem to be): she’s fearful, private, and bristly but I couldn’t help but feel drawn to her and compelled to find out the mysteries of her past that she is running from. I read All the Birds, Singing in less than a week which, bearing in mind that I read it in half hour stints on the bus to work and sometimes a little in the evenings, shows how I simply couldn’t put this book down. Wyld has created a compelling novel that is filled with tension and intrigue and, most importantly, draws a poignant portrait of a woman who is desperate to escape from her past. Evie Wyld is a novelist that I can’t wait to read more from. Both her first and second novels are brilliant and I can only expect great things from her work in the future. I admire her writing style and only hope to learn from her in my own writing. Have you read All the Birds, Singing? What did you think? Have you read Wyld’s debut novel? I loved this book too … I thought the mode of telling, the fanning out in two directions from the opening of the book was beautifully done. I really want to read this one and Wyld’s first novel – they both sound intriguing! They are definitely both intriguing and wonderfully written. I’d certainly recommend them!